Attorneys Mike Faro and Chris Crowder specialize in Chapter 7 and Chapter 13 bankruptcy. Our attorneys understand how overwhelming a financial situation can be and the many questions you may have about bankruptcy filing. We will work with you throughout the process and help you get a fresh financial start. Bankruptcy can give a family a second chance to prosper or breathe new life into a dying business. Our goal is to help you understand if bankruptcy is right for you. 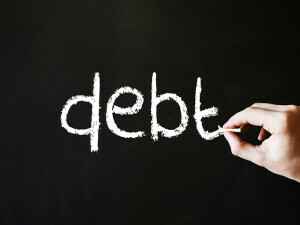 If you are behind on your house payments, car payments, or feel like you will never be able to get out of debt it may be time to talk to Attorney Mike or Chris, your local Melbourne bankruptcy attorneys. The thought of losing your home can be devastating. If you are facing a foreclosure action, it is important to seek legal assistance and learn what your options are for dealing with it. One option you may want to consider is filing a Chapter 7 or Chapter 13 bankruptcy. Many bankruptcies are filed by homeowners attempting to halt or avoid foreclosure of their home. Can Filing Bankruptcy Eliminate My Credit Card Debt? Credit card debt is one of the most common factors that contribute to individuals filing for bankruptcy protection. If you are overwhelmed by your credit card bills, filing a Chapter 7 or Chapter 13 may be the solution. Can Bankruptcy Help Stop Wage Garnishment? An important benefit of filing for bankruptcy protection is that the automatic stay goes into effect immediately upon the filing of your petition. The stay prevents creditors from continuing any collection efforts against you while your case is pending. Thus, all harassing telephone calls, demand letters and collection lawsuits against you must stop. If you are considering filing bankruptcy, contact our office to schedule a free initial consultation. Our attorneys will talk about creating a plan to get back on track. 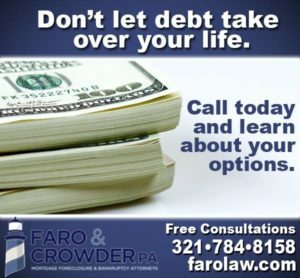 Faro & Crowder, PA, provides skilled legal representation in Melbourne, Florida. Our office is located on Sarno Road and our legal services cover residents of Brevard County. In addition, our attorneys have handled cases from Marathon Key all the way up to Pensacola, Florida. Our focus is debt relief, foreclosure defense, asset protection, real estate transactions, litigation and defense against debt collection. We are licensed to practice in the courts of Florida, the United States District Court for the Middle District of Florida, and the United States Bankruptcy Court for the Middle District of Florida. We regularly appear in courts in Melbourne, Viera, Titusville, and Orlando. The decision to hire an attorney is an important one and should not be based on advertising alone. We believe our reputation and track record speak for themselves, but we welcome you to ask our other clients about their experience working with us. Our office has been open in Brevard County since 2005, with Attorney Crowder joining the firm as a partner in 2009. Our regular hours are Monday through Friday from 9:00 a.m. until 5:00 p.m. In some circumstances, a lawyer may be available for early morning, evening, weekend, or telephonic appointments. The use of this form or any form on the website does not create an attorney-client relationship between you and the law firm. This entry was posted on January 12, 2018 by Faro & Crowder, PA..